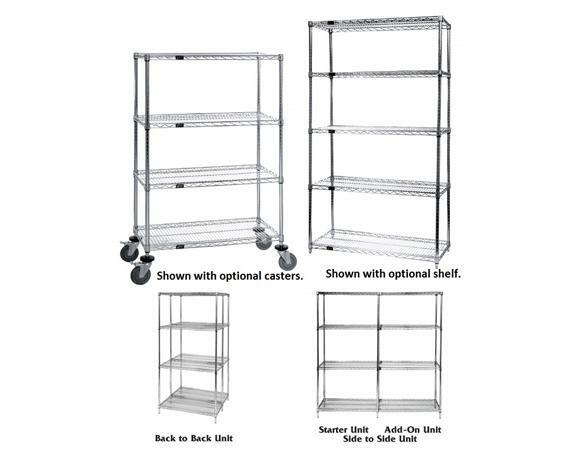 Heavy-duty chrome wire shelving – create your own unit. 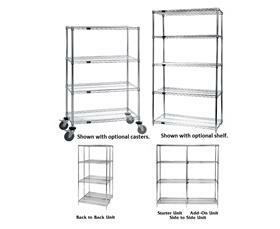 Heavy-duty chrome modular wire storage system offers a combination of shelf and post sizes to meet any applications. Split sleeve connectors with grooved numbered post allows for easy and quick assembly. Shelves are constructed of all welded wire mats and supported with architectural wire trusses providing 800 lb. capacity per shelf. Leveling legs support each corner on stationary units and polyurethane non-marking casters can be added to mobilize unit. FOB Shipping Point. 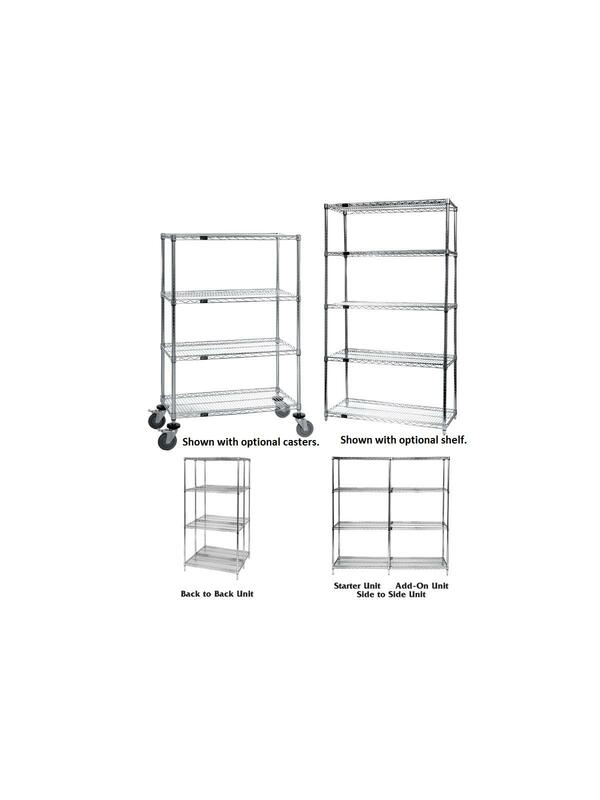 Heavy-duty shelving unit allows 800 lb. shelf capacity. 60"W. and 72"W. shelves have 600 lb. load capacity. Available in 4 different heights with 15 different shelf size options. Comes complete with 4 posts and 4 shelves. Additional shelves may be purchased separately. Allows expansion of Starter Kit by sharing a set of posts. Configuration options include straight line, back to back and right angles (L-shape). Comes complete with 2 posts, 4 shelves, and 8 S-Hooks. Additional shelves and posts may be purchased separately. Units with Add-On Kit cannot be made mobile. Easy rolling on polyurethane non-marking casters. Use in corners or for continuous runs of shelving. Two hooks should be placed where two posts are not used. May be purchased for the starter kits and add-on units. Additional posts are available in 4 different heights. Please order S-Hooks if you purchase a shelf for an Add-On. See Related Items tab for Wire Shelving S-Hooks, Wire Shelving Mobile Kit, Wire Shelving Posts, Chrome Wire Shelving Unit Accessories and Chrome, Proform & Black Wire Shelving. L x W 12 x 36" 12 x 42" 12 x 48" 12 x 60" 12 x 72" 18 x 36" 18 x 42" 18 x 48" 18 x 60" 18 x 72" 24 x 36" 24 x 42" 24 x 48" 24 x 60" 24 x 72"
Height 54"H. 63"H. 74"H. 86"H.